Contains three papers on the taxonomy of Diplopoda. This book revises the small Oriental family Haplodesmidae, Polydesmoidea, Polydesmida, showing it to be synonymous with Doratodesmidae. It offers a description of the northernmost species of a large southern African genus of Spirostreptidae, Spirostreptida from Zumbabwe. 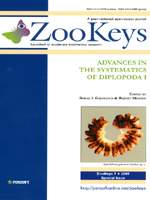 This volume contains three papers on the taxonomy of Diplopoda. The first, larger paper revises the small Oriental family Haplodesmidae, Polydesmoidea, Polydesmida, showing it to be synonymous with Doratodesmidae. Six new species are described, an old one is re described, numerous new synonymies and diagnoses are proposed, all six genera recognized as valid a redefined and keyed, as well as all their known constituent species. The second paper is devoted to descriptions of a new aberrant genus and two new species of Dalodesmidae, Dalodesmidea, Polydesmida from Tasmania, Australia. The third article provides the description of a new, northernmost species of a large southern African genus of Spirostreptidae, Spirostreptida from Zumbabwe.